The lead up to Easter has been a busy time, with the completion of teaching commitments and publishing projects and the tying up of loose ends. Good Friday serves as a severe deadline – the hiatus of Easter is imposed on us, whether we like it or not, as everything shuts down for at least the Easter weekend, although the holiday can stretch over one or two weeks. As with Christmas, it has become a national time to ‘down tools’ and after the hectic Spring term it comes as a blessed relief – thank God (or maybe we should thank the Romans, that ‘great civilisation’, for nailing a 33 year old from Bethlehem to a cross). The morning of April Fools Day has become a time to take everything with a pinch of salt, for it is the customary time for pranks, practical jokes, hoaxes and general foolery. The media ran there usual brace of dubious ‘news’ items – the Circle Line is to be used as a substitute for the Large Hadron Collider; ferrets are to be used to deliver broadband cables; AA men will use jetpacks to beat the traffic jams; Shakespeare was French; England didn’t win the World Cup in 1966… My favourite was in Denmark – recently the famous Little Mermaid statue had been removed to be displayed in the World Expo in Shanghai, leaving her rock bare – someone had replaced it with a mermaid skeleton. We joined in the spirit of this by announcing the launch of The Art of Self-publicity in the Bath Chronicle (‘Hungry for Self-publicity? Then this is the book for you’). In the Editor’s column, (‘Spotted our April Fool yet?’) Sam Holliday asked: ‘…perhaps you are convinced that our April Fool joke this year is that we have given publicity to a man who has written a book about … how to get publicity’. Actually, the book is genuine (the latest title from my small press – under the imprint, Writers Workshop – the first in a series of practical guides) and we decided to use April Fools to gain some publicity – and it worked! It was due to be launched on Easter Sunday and we wanted to let people know about the event in advance – part of my Garden of Awen. Typically, we were on tenterhooks about the books arriving on time (no matter how well-planned our new books are this always seems to happen). Yet by Thursday I had the first batch arrive from Stroud Print – phew! We weren’t the only ones launching a book that day – controversially, Philip Pullman was in town talking about his new book at Topping & Company: ‘The Good Man Jesus and the Scoundrel Christ’. This is territory I am familiar with. While studying my Fine Art degree I got obsessed about the Fool archetype and made a film called ‘My Life as a God’, which had a main character who was part-fool/avatar/insane/even an ODed drug addict having a near death experience. Alot of it was filmed in guerrila style around the mean streets of Northampton. I remember one scene where my fool character dragged a ladder up the street as though he was carrying the cross up Golgotha. A black woman harangued me – probably justifiably. It wasn’t very subtle satire on religion – a low budget Life of Brian. Yet behind it was ideas influenced by my research into mythology and Jungian psychology. Cecil Collins’ book My Life as a God was particularly inspiring. This project culminated in a free May Day festival I launched called the Fools’ Fete in Abington Park – this I saw as the completion of the Fool’s Journey – from setting out like Chaucer’s pilgrims at the start of April, to becoming feted as king-for-a-day, Lord of Misrule. Thousands of people attended the Fools Fete, which ran for three years, with the help of the Umbrella Fayre people, who have since gone on to run the Green Fair which happens in September. Yet I started the ball rolling – I recall walking by the bandstand one day and thinking: ‘this would be a great venue for a festival’. I came up with the name and format of the first Fools Fete, booking the bands. All creativity starts like this – with an act of awareness. Blake said: ‘If the doors of perception are cleansed, man will see things as they truly are – infinite.’ Being a big fan of LA psychaedelic rock band The Doors at the time (who took their name from Huxley’s book The Doors of Perception, inspired by Blake) I identified with this, perhaps too closely! A young sailor went to fight in the Napoleonic Wars – wrote to his mother asking her to save him a hot cross bun for Easter, when he plans to be home. Alas, he fails to return – but the mother dutifully saves a bun for her son that year and every year since, until her death. The pub goes through various phases – from The Bun House to the Widow’s Son, named in honour of the woman. It is pulled down and rebuilt, burnt down and rebuilt, mirroring the resurrection connected with that time of year. Every year Navy personnel gather to honour the tradition with alot of drinking and singing (including the modern ‘tradition’ of karaoke) and the ‘hanging of the bun’ when a bun is ritually placed, by the youngest sailor present, in the net above the bar. The bar is in the east end of London, in the Stratford area – rough-and-ready locals and Navy guys mix together. The following day, Easter Saturday, I loaded up the Triumph Legend and set off over the Cotswolds up to Northampton – to visit my Mum and sister, whom I haven’t seen since last summer (Winter isn’t the time for long bike rides). It was great to catch up with them and my friend Justin, that night down the Malt Shovel – we opted for a relatively quiet pub because we too had alot of catching up to do. Earlier that evening I had sat down with a meal cooked by my Mum (a rare treat) and watched the new Doctor Who – starring Northampton-born Matt Smith – it felt like being a child again! Watching Doctor Who Saturday teatime was a childhood ritual for many of my generation. Who would have thought it would become popular again? I can’t say I’m wildly keen about the new incarnation, but for one night it was heart-warming trip down memory lane. The next day, after visiting the memorial tree planted in memory of Dad in Delapre Abbey with my sister and her toddler, (and enjoying a mighty Sunday lunch cooked by my dear Ma) I bid farewell and set off – roaring back over the Cotswolds. 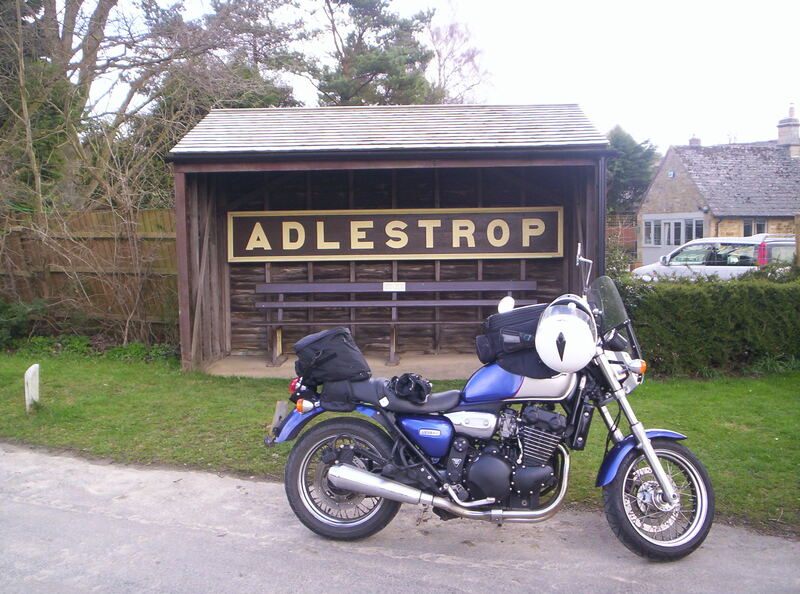 I decided to break the journey about halfway at a place of literary significance: Adlestrop, one of the soul-springs of England. Here, in June 1914, Edward Thomas, on a train (possibly to Dymock) paused and made some notes – later, when he started to write poetry, encouraged by his friend Robert Frost, he wrote ‘Adlestrop’ which has become a classic of English verse, much anthologised and imitated. It was very poignant to stop there, kill the engine and hear the birdsong he wrote about. I sat in the bus stop which has a large station sign and Thomas’ poem engraved on a brass plaque, and soaked up the peaceful ambience of this quintessentially English hamlet, a corner of England which motivated men like Thomas to go and fight – to live and die for. I returned home in time to listen to a Radio 4 feature on the Blakean poet Michael Horovitz, who has recently turned 75. Hearing his antics inspired me to make the Garden of Awen a lively ‘happening’ later that evening – after I had ‘regenerated’. Somehow I summoned a second wind and set off to the Chapel, bag bulging with books and goodies. The theme of the evening I had chosen was ‘Tricks & Fools’ – this was probably tempting fate (in my intro I talked about the Fairy Tradition wisdom: Never test the Crew that Never Rest). The trickster was making his presence felt when I arrived to find the place locked up. We were told somebody would be there from 6pm – it was 6.30pm. David and Terry arrived – we sat over the road in the Lamb and Lion and anxiously waited. 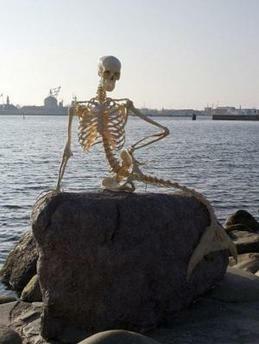 I had tried to ring the director, but he was away on holiday in Cornwall. He had left his team in charge… Fortunately the bar manager turned up at 7.15pm, and let us in. We hastily set up – doors opened at 7.30pm – and the evening kicked off. Phew! We had a good crowd – the place was packed – almost standing room only, until they got some more chairs. 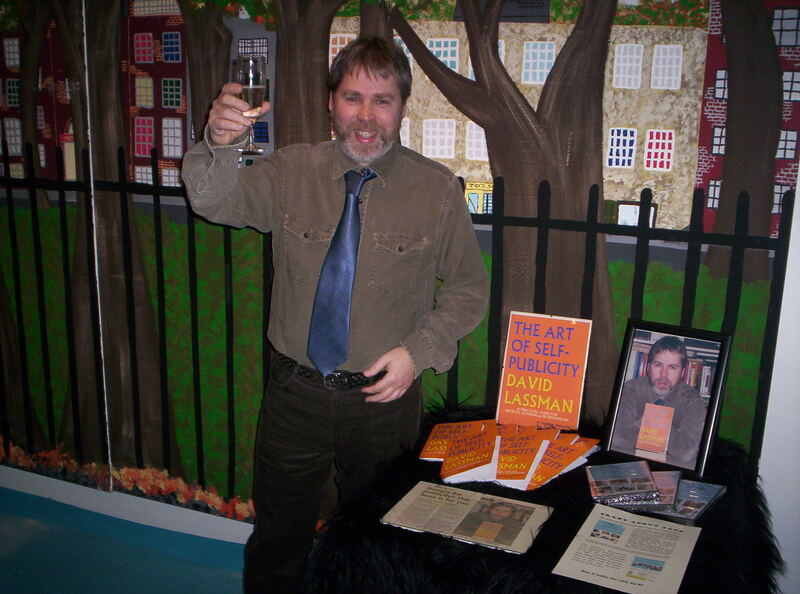 I had arranged some champagne (well, Prosecca) to toast David’s new book, and there was free chocolate on the tables. The atmosphere was great – there was a colourful crowd of creative types present, including a group of girls from Glastonbury all dressed up as Victorian harlots! 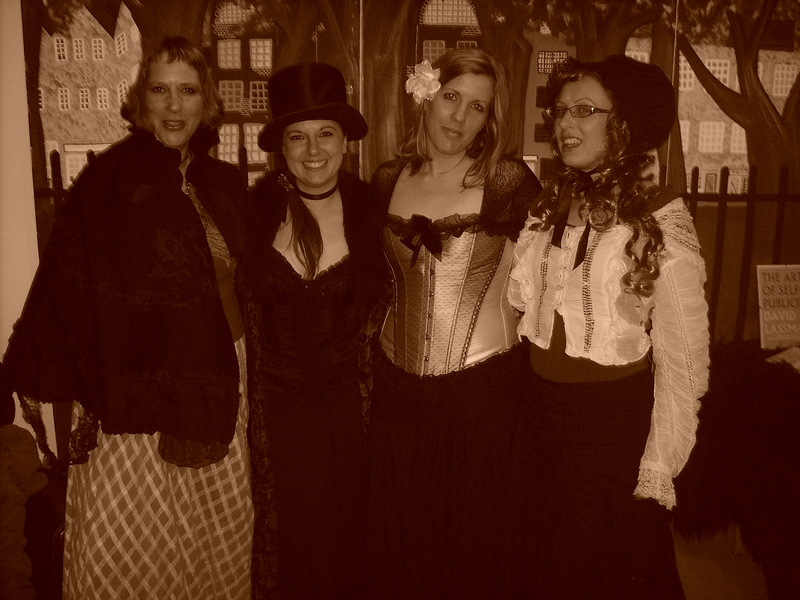 Victorian harlots at Garden of Awen! I kicked the evening off with my mobile phone poem ‘Phone Tree’ (asking people to leave their phones on for the performance), then David gave a talk about his book – regaling us with Adventures in Media. 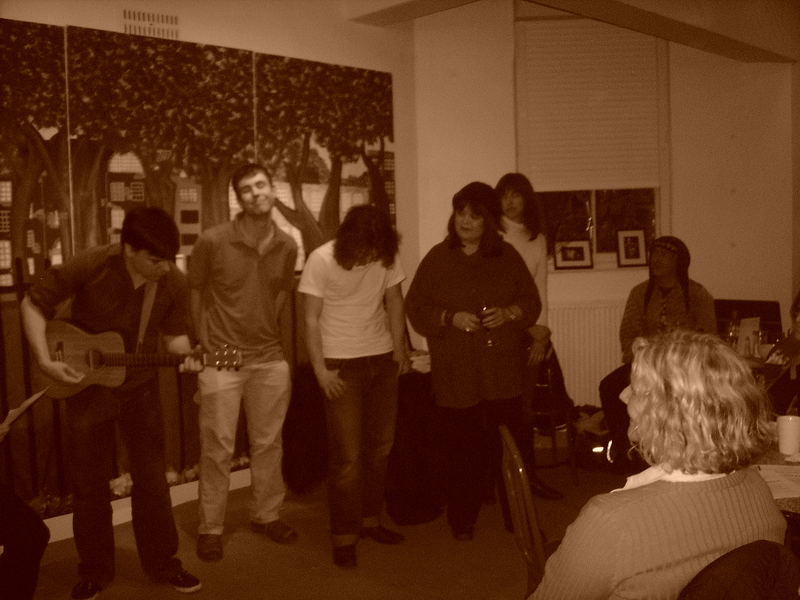 There followed an open mic section – with some excellent contributions from the floor: poems and songs. During the break David signed copies of his book. I put on Patti Smith’s classic ‘Horses’ (starts infamously with: ‘Jesus died for somebody’s sins but not mine’). A friend of an older member of the audience asked me to turn it down because she had a hearing problem! I welcomed people back by asking for forgiveness for playing the Devil’s music on the Lord’s day – save our souls! Then I asked for a moment of silence – as I recounted my visit to Adlestrop earlier in the day, before sharing my version of Thomas’ famous poem (with apologies). The second half formally started with a fabulous set from Crysse Morrison, poet from Frome. 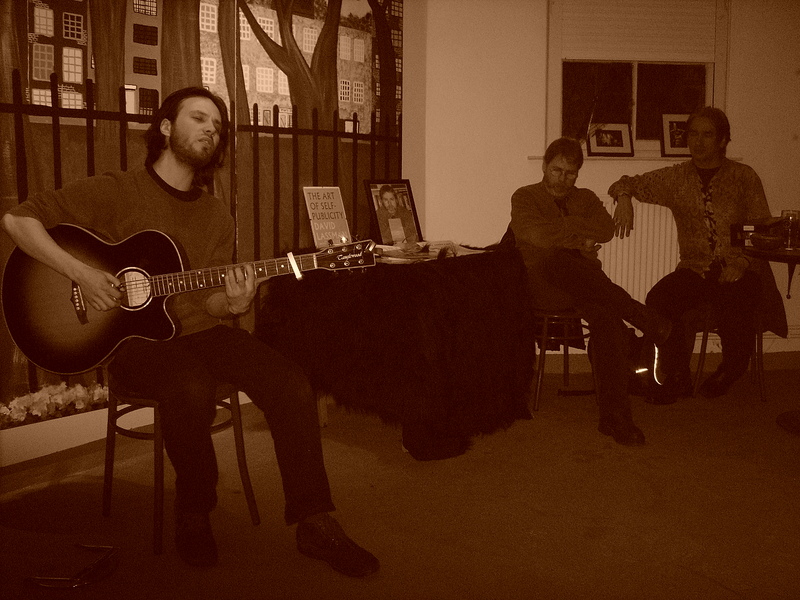 More open mic, including an improvised shambles from Ben and friends – Ben was going around Britain recording songs, a kind of British songline. It was a brave attempt at something experimental, which is what I love to see. Afterwards, I said: ‘Creativity is an act of folly – a leap of faith. You step off the cliff and hope for the best.’ I observed how many great artists and poets of history have been perceived as foolish, even mad in their day – and to emphasise this I shared my poem, ‘The Man from Porlock’, written in the voice of the personage who notoriously interrupted Coleridge while he was working on his poem Kubla Khan. Such people are always there to test your tenacity! A pox on doubters and critics! Blessed are the doers, the finishers. We finished the evening with a sublime set from singer/songwriter/guitarist Ali George (whom I discovered one night in The Star – he was jamming in the corner with a friend, playing a Van Morrison cover). Ali treated us to new songs – he’s a talent to watch. This is exactly what I want the Garden, and Awen, to be for – a platform for up-and-coming talent. Grassroots genius – happening without the ‘filtering of the Fat Controllers’, as I put it – right here, right now. It was a great night – my folly had paid off for once! The following day went to the Mells Daffodil Fayre with a couple of friends. Kevin drove us over in his 1985 Mercedes SL ‘panzer’ with Creem blasting out – very Withnail-like but not doing much good for my hangover. Still, it was a merry way to travel. Pulling into the carpark we were let in for a quid as a ‘classic car’. I got us all a hot drink and we took in the atmosphere – everyone and their dog was out, gorging on chips and beer, listening to the bands in the marquee, or elbowing their way down the packed narrow streets lined with stalls. I showed Kevin the grave of Seigfriend Sassoon, First World War poet and personal hero. Then I took them into the church to show them the Burne-Jones designed tapestry. Mells is such a charming, unspoilt village – preserved in a kind of time-warp: a perfect setting for a Hammer House of Horror episode (a couple lose their way in the fog…). Today, it couldn’t have been merrier, or more picturesque – the grassy banks glowing with daffodils. In previous years the daffs have often passed their prime by the time of the Fayre – but with the late Spring this year, they were in their glory. We supped beer, browsed the stalls, missed the Morris Dancing and checked out the lovely Manor House Gardens. As the afternoon progressed we become ‘daffed’ out – I offered ‘tea and buns’ back at mine, so off we set, finishing off the last of the hot cross buns. Agreeably bulging, I found it hard not to nod off on the sofa. The week/end had taken its toll, but it had been a memorable Easter. Thank Christ we don’t have to do it for another year! This entry was posted in Bard on a bike, Bardic Poetry, Britain, Extraordinary People, Extraordinary Places, Seasonal and tagged Adlestrop, Aldous Huxley, Ali George, April Fools, Bath Chronicle, Bun Day, Chapel Arts Centre, chocolate, Crysse Morrison, David Lassman, Delapre, Doctor Who, Easter, Easter eggs, Edward Thomas, Fairy Tradition, Fools Fete, Garden of Awen, Mells, Michael Horovitz, Northampton, Philip Pullman, The Doors, trickster, William Blake on April 6, 2010 by Kevan Manwaring. It’s been a busy week of teaching and barding about. I’ve been running creative writing workshops at King Edward’s School (est. 1552!) around the story of King Bladud, for a Bath Fringe 2009 event, King Bladud’s Pageant, a celebration of Bath’s legendary founder to coincide with the Bath Pageant, an enormous event that took place in Sydney Gardens in 1909. Hundreds of local people joined in, as can be seen from the fabulous photos. It’s a shame B&NES Council didn’t get behind this event and encourage all to take part. Richard Carder, the organiser, was originally refused funding but eventually managed to get some from somewhere – and so me and fellow poet Rose Flint got the green light to run our respective workshops. I was chosen to run workshops for Year 7 at Richard’s old school (where he taught music for many years). Rose ran goddess-writing workshops for adults and has written a libretto to be performed on the day. In Parade Gardens on the 7th, between the start at The Circus at noon and the concert in Chapel Arts Centre at 3pm, I’ll be performing extracts from my poem Spring Fall: the story of Sulis and Bladud of Bath, which won me the Bardic Chair of Bath in 1998. It has been republished by awen in a special 10th anniversary edition which includes my prize-winning short story, Taking the Waters – deemed so controversial Le Bath Chronic was too scared to publish it! Tuesday I did another session at King Edwards, getting the kids to write poetry on the theme of flight, to link in with the lesser known aspect of the Bladud story. In the evening I blatted over to Chew Valley School to run my creative writing workshop there for adults. A good session, but I wished I could have been at the Bardic Finals in Glastonbury (when the new Bard of Glastonbury was chosen) but there you go. No rest for the self-employed. Wednesday, I had my last session with members of BEMSCA, (Bath Ethnic Minority Citizens Association) at Fairfield House, where Emperor of Ethiopia and Rastafarian god, Haile Selassie, stayed during his time of exile (1936-1941). I had been asked to help them produce a booklet of the members’ life writing (all first generation, post WW2 immigrants). They all have incredible stories to tell – and many of them were keen to tell me! I was shown lots of photos – some very old and rare – of numerous relatives and achievements. It was touching and I felt privileged to be allowed a window into their world, to be trusted with their treasures, their precious memories. When the book, Life Journeys, is ready there will be a launch at Fairfield House. I hope to be there to celebrate the residents’ achievement, which is in small measure because of the hard work of the staff there and Norton Radstock College’s support (they’ve been running IT sessions there since last Autumn – and now they’re all surfing the web). Quite rightly, it has become an award-winning project. Wednesday evening I ran the Bath Writers’ Workshop at the New Inn. 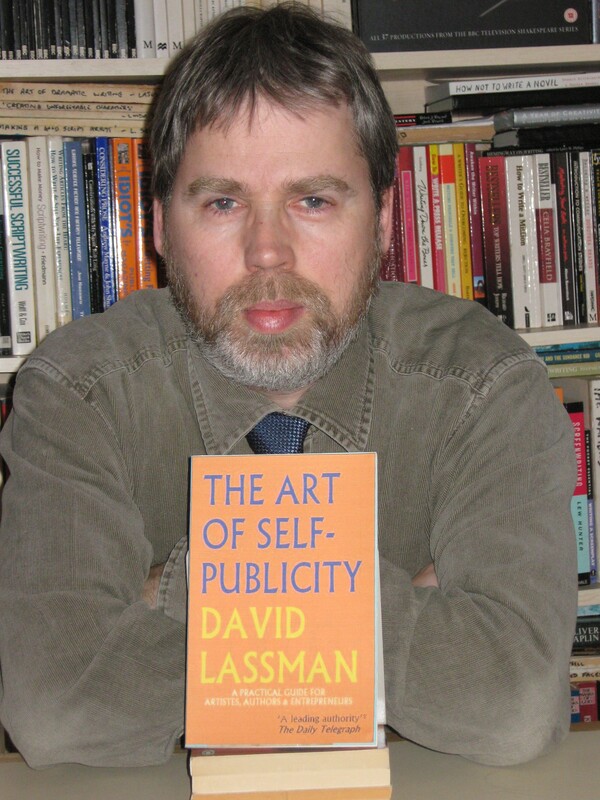 This has been going well since we moved to our new home in January – the snug bar of a great back street pub – and since I joined forces with the inimitable Mr David Lassman, esq., master self-publicist and screen-writer. Next week, for our monthly Fourth Wednesday session, we have 2 guest writers in conversation: fantasy novelist Jessica Rydill and Chrissy Derbyshire, whose first collection, Mysteries, I published last year thru Awen. Thursday I turned to my stack of marking from the Open University – for A215 Creative Writing – I had hoped it might have diminished if I ignored it long enough, but no, it was still there…like a squat toad, waiting for me to snog it. I hoped its inky skin would have edifying properties. Somehow, amidst all this I have been able to make significant inroads into my new novel, the fifth and final Windsmith novel, The Wounded Kingdom – about 9000 words. This is all that keeps me sane! As long as I can write every day I feel as though I am honouring my own creativity. Tonight, though, it’s the opening of the Bath International Music Festival with a big free Party in the City – time to dance in the streets! This entry was posted in bard and tagged Anthony Nanson, Bath, Bath Fringe, Bath Storytelling Circle, Bath Writers Workshop, BEMSCA, Bladud, Chrissy Derbyshire, David Lassman, Haile Selassie, Jessica Rydill, King Bladud's Pageant, Richard Carder on May 22, 2009 by Kevan Manwaring.